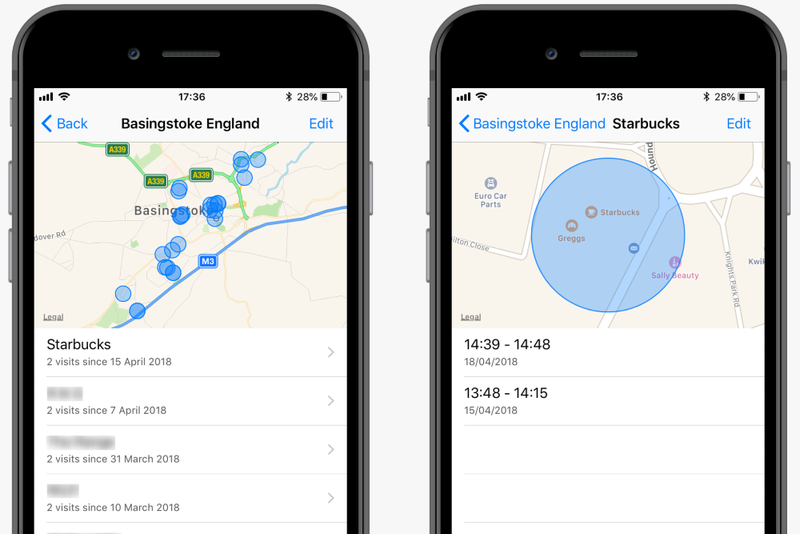 You may have noticed whilst out and about that your iPhone will sometimes offer location-based advice, like how long it will take to drive to a particular place. What you may not know is that in order to do this, the iPhone is continually tracking where you are and where you’ve been. This feature, which Apple calls “Significant Locations”, is designed to keep a record of places you visit regularly and then use this data to “provide you with personalized services, such as predictive traffic routing, and to build better Photos Memories.” The feature is turned on by default on all iOS devices and the locations it records can be viewed at any time as a list or even on a map. It’s important to note that this data is kept on your phone and is not accessed by Apple. But nevertheless, could still potentially be viewed by anyone who gets hold of your phone. When viewing stored significant locations, each place shows how often that place was visited as well as the duration of each visit. The accuracy and extent of the data collected seems to vary somewhat between different regions, devices and carriers but, here at Certo, we’ve been testing this on an iPhone for a few months now and the results are startlingly accurate and thorough. For example, even a 20-minute lunch stop during a long car journey was logged and correctly showed the date, time and location on a map. How to view Significant Locations? Enter your passcode or use Touch ID or Face ID when prompted. On the first screen you’ll see a list of towns and cities that you have visited. Just tap on a city to view the map, all the locations you’ve visited in that city will show on the map. Below the map is a list of all locations visited in that city, tap on one of these and you’ll be shown a zoomed-in map pinpointing that exact location and another list this time detailing the dates and times of your visits to that location. How to remove Significant Locations? You can remove all stored locations from your phone by following the instructions above to access the Significant Locations screen and then tapping the Clear History button at the bottom. You can also selectively remove individual stored locations by tapping the Edit button in the top right of the screen and then deleting the individual location using the red circle. How to turn Significant Locations off? If you’d prefer not to be tracked at all, you can turn the feature off entirely. Just follow the instructions above to access the Significant Locations screen and then tap the slider at the top of the page to turn it off. Bear in mind that you may lose out on some features, such as predictive traffic routing, if you do this. If you found this article interesting and are looking for more ways to keep your device secure, don’t forget to check out Certo iPhone, Certo Software’s industry-leading spyware detection tool for iPhone and iPad.